As soon as you enter this famous Japanese eatery in the city, you feel a sense of comfort. With its wooden tables, along with a separate traditional Japanese-style low seating with tatami mats and even a Sake bar, Kofuku has a lot to offer, and we’re not complaining one bit. Where does one begin? We’ve visited the place so often, we know most of the menu by heart now. But, let’s tell you what we’ve loved. We started off with the tempura, served with a sauce of wasabi, scallions and soy. Fried stuff is great, isn’t it? Well, we certainly think so. A nigiri platter was the next thing we had to have, with salmon, prawns and egg nigiri and pickled ginger (omg! ), wasabi and soy on the side. While the presentation was exquisite, we loved the burst of flavours in the mouth. The salmon carpaccio is another thing you should try, that with pieces of jalapeno to add that extra hot burst of flavour; and don’t miss some of their soups, one of our current favourites being the kimchi jjigae soup (spicy & sour). If you’ve gone in a large group, make sure you get yourself the sushi platter (18 pieces), and if you’re into salads, try their tuna sashimi. For mains, you could get your hands on black cod in miso (perfect if you’re a seafood lover), the Hambagu steak (mince meat patty with a great sauce), or their Kakuni pork (belly). 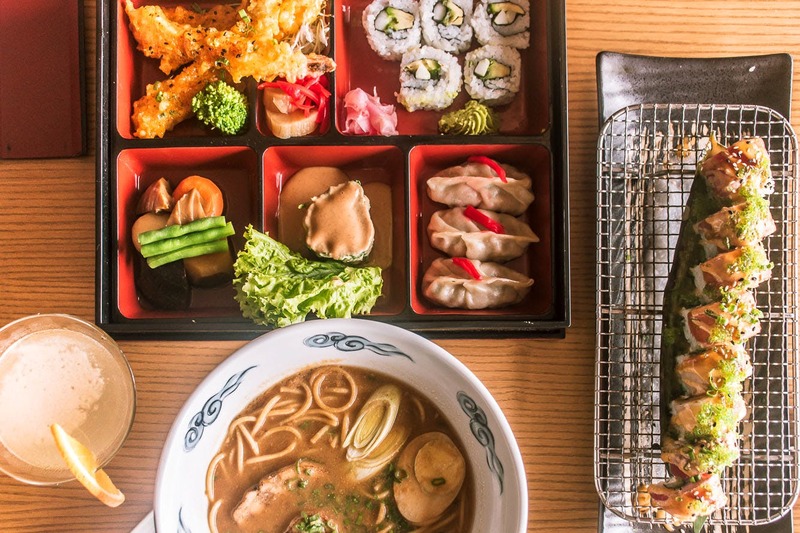 The Bento Box meal is another sight for sore eyes, it looks as delicious as it tastes. Okay, if, after all this, you still do have some space, their ramen bowls are a must-have. Wash all this down with some Sake, and to end your meal, try their matcha green tea ice cream or their signature dessert, mochi ice cream, served in two flavours. One of their signature dishes is the Oh My God sushi, (flaming sushi roll) can make you forget everything around you when you take the first bite. And, while we love their mochi ice cream, you should try their green tea kakigori – a dessert that has fruits and mango sauce on green tea ice cream. Did we hear you run out that door already?